As an FMC distributor, Arm-Tex works closely with FMC to deliver fluid handling solutions. Today, FMC Technologies is working harder than ever to make sure you get the exact Chiksan® swivel joints you need, when you need them. From fire trucks to offshore fracking, FMC Chiksan swivels are the most rugged and long lasting swivel on the market today. Chiksan swivel joints are metal pipe fittings with integral ball-bearing swivels. Chiksan Swivel Joints are pressure rated in Ductile Iron to 750 psi, Carbon Steel to 1000 or 6000 psi, and up to 20,000 psi with the Triple Step Swivel Joint. These rugged fittings come in 3/8 inch to 12-inch sizes and can handle cold working pressures up to 20,000 psi. Chiksan swivel joints are available for sour gas services at cold working pressures up to 15,000 psi. Chiksan ball-bearing swivel joints have been solving industrial fluid handling problems since 1928. Wherever all-metal, flexible fluid handling lines are required, Chiksan original swivel joints are a constant. 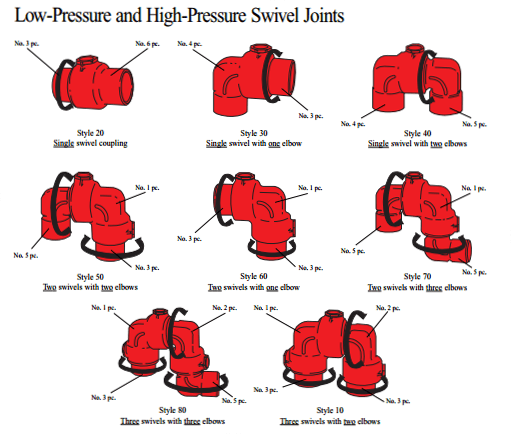 FMC Chiksan offers a variety of swivel joint styles. To see all styles, click the image below. If you are unsure of the best style for your application, please call Arm-Tex today at 800-536-1983. Contact Arm-Tex today to discuss how FMC Chiksan can help solve your industrial fluid handling problems.